I stress over roasting a turkey. While there have not been any turkey catastrophes over the years, each year I try to find a different way to make the bird. It makes me nuts to sit around, waiting for the thermometer to start buzzing and then find that the dark meat is done fine and the white meat is dried out. Sure--plop gravy on it and it recovers, but this year I was looking for a different way to cook it, and both kinds of meat to perfection. We do Thanksgiving with my folks--they prepare some dishes and I prepare the rest. This year my dad got the bird and I am trying something new. Braised turkey--cutting it up into pieces, browning them on top of the stove and then nestling the dark bits into sauteed mirapoix and white wine and broth. Roast for 90 minutes, then insert the breast meat and roast another 1.25-ish hours. This should insure that the dark meat is well done, the breast not dried out and all the pieces nestled in moist heat. When the meat is done, it rests in the covered pan for 45 minutes while the sides are baked. Voila!! What does this have to do with antiques? The turkey will be served on a vintage platter. Happy Thanksgiving!! 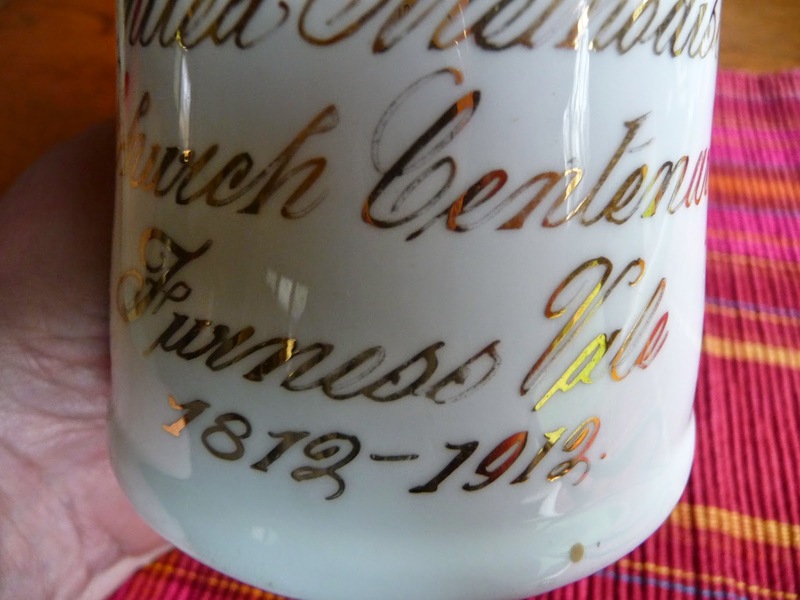 About six years ago, when Dear Husbola and I were in England, we happened upon a sweet little white porcelain cup commemorating the 100th anniversary of a United Methodist Church. 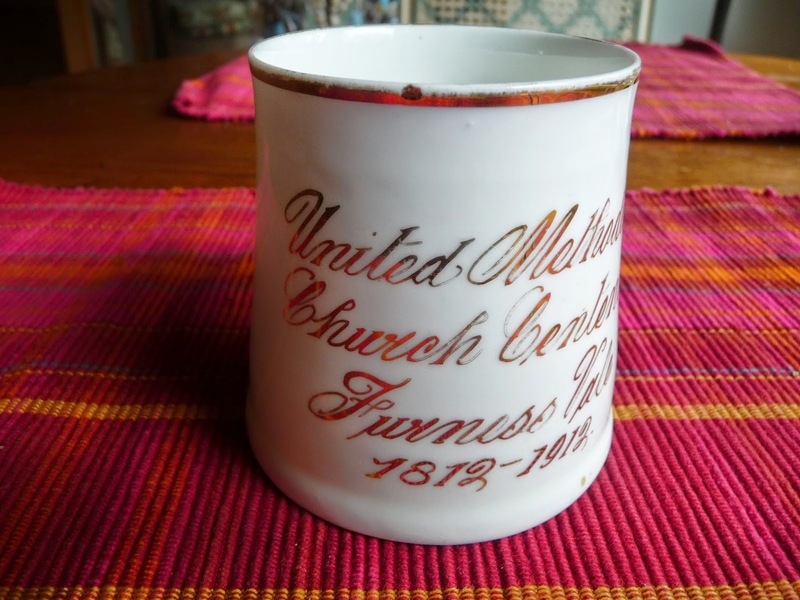 The gold lettering said "United Methodist Church Centenary Furness Vale 1812-1912" This must have been a fundraiser or a giveaway to a congregation once so proud to be 100 years old, located in a small town near Manchester England. But the church did not make it to 200 years old. According to David Easton, Archivist of the Furness Vale History Society, "The Methodist Chapel in Furness Vale played an important role in the community and for a long time was very well supported. Sadly it closed about 10 or 12 years ago. They were required to provide access for disabled people, which given the design of the building would have been very expensive. Limited funds and an ageing congregation meant that the Chapel was at the end of its life. The congregation joined the Anglican Church and the building was sold. It was converted into apartments but not very successfully as some have always remained unsold." What a sad commentary on our society today--and I am afraid happening in many communities both in the UK and in America. Regulations that have no conscience and people with no common sense who administer them, that ring the death toll for small, historic, or sacred buildings and the people who care about them. 1912 was a memorable year in Britain-- coal miners were on strike, suffragettes were marching on London and other places in an effort to get the vote, and the country was two short years away from the start of World War I. And the sinking of the Titanic in April 1912. The titanic hit an iceberg and the United Methodist Church of Furness Vale hit a wall of regulation. The cup is returning home. 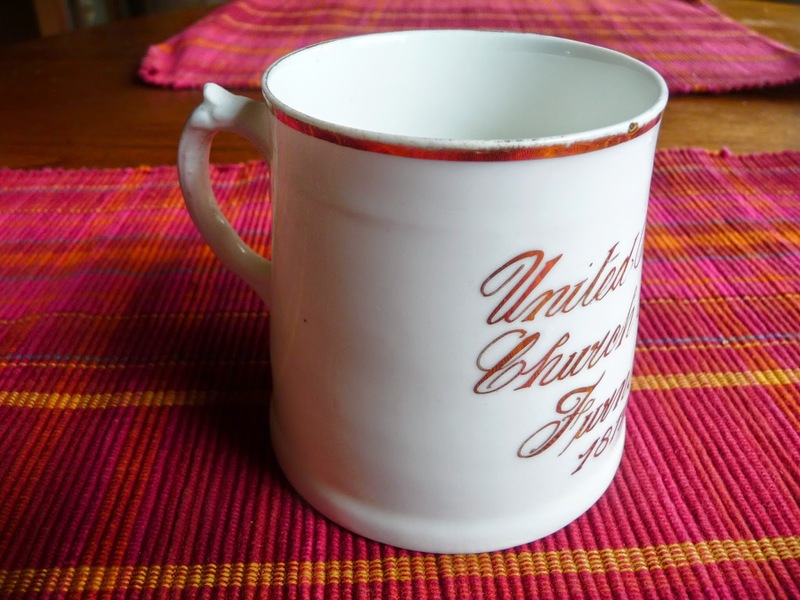 We are sending the lovely little piece back to Furness Vale--to put in a museum or archive, or to be given to a local resident who remembers the sweet old church when it was a church. Dear Husbola and I decided that we needed a break away and headed off for a visit to Taos New Mexico. Airline miles made the trip even more attractive and we have just returned from fresh air, fabulous food, quirky hotel, plentiful art and very friendly people in the Land of Enchantment. We packed all our troubles in the old kit bag and left it at home. And we left our car at home too. Rental cars are not our usual thing--but we are glad we had one as we put on 500 mountain miles of driving. Wouldn't you know it--we found fabulous scenery and antiques shops with things to buy that we could not because we did not have our own car. We were not expecting to find things to buy. This was pure vacation, not a business buying trip. Until we found a great shop in Rancho De Taos and a delightful owner Holly who volunteered to send our purchases home. We bought some great things and expect their arrival in less than a week. Not so fortunate for us at a great looking shop outside of Dixon NM--it was painful to look at two fabulous 1940s chrome and red vinyl chairs, probably from an auto showroom waiting room or greyhound station that would have certainly come home with us had we our own vehicle. Another 1950s chair was adorable and that would have fit too. Nope, Nada. Left empty handed. The vacation was perfect and refreshing and one of our best. Taos--we will be back. And next time--we drive out.